If the New York Times exposé on the sweatshop-like working conditions manicurists go through in New York wasn’t depressing enough, part two of the story, which was published today is equally as alarming. Besides the unfair and dubious labor practices of salon owners, workers are also gambling with their health to make sure your nails are “on fleek.” The chemicals manicurists use day in and day out, particularly dibutyl phthalate, toluene and formaldehyde could be the reason for all the adverse health side-effects that many manicurists suffer. While health issues like breathing problems, skin conditions, miscarriages, children born with disabilities and even cancer seem to pop up for this segment of the workforce, there is little research on how the chemicals are actually affecting manicurists. But their health issues are hard to ignore. As Flushing, Queens doctor Charles Hwu told the Times, his patients, “come in usually with breathing problems, some symptoms similar to an allergy, and also asthma symptoms — they cannot breathe. Judging from the symptoms with these women, it seems that they are either smokers, secondhand smokers or asthma patients, but they are none of the above. They work for nail salons.” One manicurist, after 20 years in the game, barely had any fingerprints left thanks to years of handling corrosive chemicals. One woman, who spent a lot of her day breathing in acrylic powder developed a lung disease called sarcoidosis. 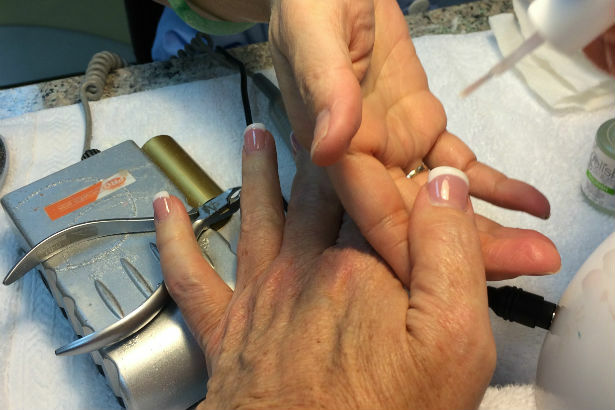 Other manicurists around the country report respiratory and skin conditions. “A number of studies have also found that cosmetologists — a group that includes manicurists, as well as hairdressers and makeup artists — have elevated rates of death from Hodgkin’s disease, of low birth-weight babies and of multiple myeloma, a form of cancer,” the Times report said. So not only are New York manicurists forced to endure low pay, racist and dubious labor practices, but they are also getting sick because of it – as are manicurists around the country. A $40 dollar a day pay rate already doesn’t seem worth the hours many manicurists put in, but when you add on the health issues associated with the business, it seems even less worth the trouble, though plenty of manicurists, many of whom are immigrants, have trouble finding other jobs. We can only hope that by uncovering these issues, both the cosmetics industry and the government will take steps to reform the system, and make sure that manicurists are not only treated fairly but aren’t getting sick because of their jobs.